I think my first bowl of ramen was at Tampopo on Manchester’s Albert Square in the late 90’s. I’ve been quietly addicted to the combination of slippery noodles in hot broth ever since. When I left Manchester Wagamama has been my consistent source of a ramen-fix, but I’ve always known there was better out there. I have found it at Tonkotsu on Dean Street in Soho. The place is small and busy at 7pm on a Monday evening. There is a first floor (according to other bloggers) but my friend and I were shown to a shared table next to another couple. The decor is all unvarnished wood and metal grills – a bit industrial, but pleasant enough in dim lighting. As the dining room is small, so is the menu. There are three mains: Tonkotsu ramen, Tokyo ramen and Miso and Shimeji Mushroom ramen (the veggie one). I suppose there aren’t many restaurants that can claim that 1/3 of their menu is vegetarian! Joking aside there are a good proportion of vegetarian side dishes to go with it. I ordered the miso ramen and a plate of shiitake and bamboo shoot gyoza to share with my friend. The gyoza arrived first. The dumplings were stuck together with the crispy side up. The shiitake filling was rich and savoury, but needed some of the chilli oil (on the table as a condiment) to give it a lift. There was no need for any condiments to boost the main course. The noodles were soft but springy at the same time, the mushrooms were cooked but still had bite and texture, the seasoned egg was firm with a soft yolk and a rich flavour, but it was the stock that blew me away. I’ve had miso before – savoury, umami but with flavours in the tenor range, maybe a bit of baritone. This miso was definitely in the bass section. It was deep, satisfying, mouthfilling. My friend loved the tonkotsu stock, but I didn’t feel I was being shortchanged by having the vegetarian option, not at all. If they’re getting the ramen right, they’re also getting the service right. It was prompt, friendly and attentive. Table-turnover was pretty quick, and there’s an eat-up-and-go culture to noodle places, but when my friend and I made it clear we wanted to linger a bit we never felt pressured to leave. I’ve never eaten ramen in Japan, so I’ll let other, more knowledgable, people speak to the authenticity of the ramen. I don’t care. I’ll be too busy thinking up excuses to go back. Dinner for two, including beer and service came to £38.60. After our visit to Inamo, we still had a craving for Japanese food. The next restaurant on our list of ones to try was Satsuma down the road from Inamo on Wardour St. No gadgetry here, just a large menu with an impressive vegetarian selection and good service. I went for the Tofu Steak Bento Box, with a side order of seaweed salad. The bento box had fried tofu with a sprinkling of toasted almonds with a teryaki sauce, a couple of pieces of cucumber and avocado sushi, salad, crispy fried potato cake, rice and pickles. There was also a bowl of miso. 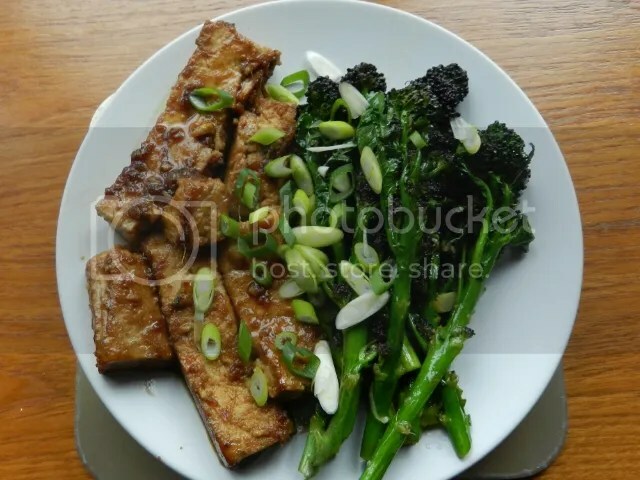 The tofu was great, crispy on the outside with a sweet teryaki sauce round it, a satisfying focus to the meal. The sushi was fine. The lettuce salad had that tangy salad dressing that I’ve only ever had in Japanese places. However, I question the whole ring of yellow pepper on it – how are you supposed to eat that with chopsticks? The potato cake was a bit bland, but then it’s a potato cake! A bit of wasabi and soy helped it along. The great revelation of the meal was the seaweed salad. It was served over ice in a sundae glass. It achieved a mixture of crunch and slipperiness that tasted a whole lot better than it looks written down. It had a cooling dressing that had to have mint in it somewhere. It was completely refreshing and I think would work better than ice-cream to cool you down on a hot day. I was impressed with Satsuma’s vegetarian selection. There were at least a couple of options in each section to choose from, so there were other bento boxes I could have had, which is great compared to the standard solitary veggie option you too often get. The only questionable item was the miso soup that came with the bento box. The standard miso soup on the menu wasn’t marked as vegetarian. I asked the waiter about it and he went to check. He came back, a little too quickly for a trip to the kitchen, to say that yes, the miso soup was vegetarian. I wasn’t convinced (and neither were my companions) so I took a quick sip. It had too deep a flavour to persuade me that it was based on a veggie rather than dashi stock, so I left it be. There was enough to eat without it so I didn’t miss it. Next time I go I shall make further enquiries. Dodgy miso soup aside, it was a very satisfying experience. The service was quick and plentiful. The ambience was lively (for once I wasn’t on the loudest table in the place). There are great veggie options. It was very reasonably priced for Soho and Japanese food. Dinner for three, including wine and service came to £101. It wasn’t the food that drew us to Inamo, it was the gadgetry. Inamo doesn’t have printed menus and the waiters don’t take your order, instead you have a touch-sensitive area on the table and the menu is projected on to your table. You make your selection from that. While you are waiting you can change the pattern that’s projected on to your table and maybe play a game of battleships with your friends (we didn’t). The menu tells you that they aim to have your selected dishes with you within 15 minutes. In our case it took less than that, but they bring each dish as it is ready, so things will arrive randomly. We stayed with the small dishes and side dishes rather than go for a main and there is a reasonable selection for the vegetarian. First to arrive was the vegetarian temaki, two smallish handrolls of lightly steamed veg in rice, wrapped in nori. It tasted fresh and light, especially as the dipping sauce wasn’t the usual soy and wasabi mix. I don’t know what it was but it had a fruitier flavour rather than the salty soy hit and it complemented the rolls perfectly. Watch when ordering miso soup, as there are both vegetarian and non-vegetarian options. It was nice, it was miso, there’s not much else you can say about it. Vegetarian maki rolls were five rolls with peppers and avocado, topped with a drop of mayonnaise. Again, fresh, light flavours. The cripsy silken tofu was nice. Crispy on the outside and melting inside with a oyster mushrooms and a deeply umami sauce. This, however, was the first menu item where I thought ‘is that it?’ £6.25 for four, small cubes of tofu and one mushroom, is expensive. Having said that, Imamo is not a cheap-eats place. Dinner for two, including a glass of wine each and service came to £99. Special occasions only, I think. The best item on the menu, was also the best value for money. The kai lan in black bean sauce was a plateful of steamed leafy vegetable. The black bean sauce add an umami sweetness to the iron-bitterness of the green leaf. That as a side dish with a main, rice and miso soup as a starter and you might get out of the restaurant without your bank manager complaining. I enjoyed the meal. The gadgetry was amusing and it worked. The staff were helpful and prompt. The food was of excellent quality, but with a price to match. I’ll go back, but not until after next payday!